“First mulligan of the day.” Tony said as he shuffled his first hand into his library and drew a new hand. Both players had not dropped a match all day long, but this would soon change. He kept his six. Though he didn’t go first, he had the first play of the game with a Gitaxian Probe, targeting Christian. Christian revealed his hand, a Vapor Snag, two Think Twice, a Forbidden Alchemy, and 2 Swamp. After drawing a card of the Probe, Tony played an Island. Christian played a Swamp and passed. Tony had a Lord of the Unreal, but that met a Tribute to Hunger on Christian’s turn. Tony kept plowing through, landing another Lord of the Unreal and a Phantasmal Bear. Tony sent them both in for 5 damage, but Christian cast a Forbidden Alchemy, then a Vapor Snag on the Lord to take only 2 damage. Tony then recast the Lord and followed up with a Phantasmal Image copying the Lord of the Unreal. Christian wiped out the entire board with a Black Sun’s Zenith for 3, then passed the turn. Tony cast a Gitaxian Probe to reveal Christian’s hand—a Mana Leak, a Think Twice, and a Frost Titan. When Christian passed the turn, Tony activated his Moorland Haunt to generate a 1/1 Spirit. The newly created Spirit token attacked for 1, then Tony cast another Lord of the Unreal. Christian countered it with Mana Leak, and even though he had three mana open, Tony put the Lord into his graveyard. Christian cast his Think Twice during the end of Tony’s turn then tanked during his own turn, but eventually ended his turn. Ton generated another Spirit then attacked to bring Christian to 17. Another Spirit at the end of Christian’s turn upped Tony’s Spirit count to 3, but Christian depleted it with a Snapcaster Mage flashing back Tribute to Hunger. Christian’s Frost Titan met a counterspell but he was undeterred. A subsequent Unburial Rites targeting the Frost Titan was countered as well, but the flashback resolved, bringing old Frostie into play, tapping down a Spirit token. The Spirits in the sky flew over the Frost Titans to take Christian down to a mere 8 life, but the Frost Titan was slowly tilting the game onto Christian’s favor. A Dissipate on Tony’s Vapor Snag pushed the Frost Titan through the red zone, bringing Tony down to 5 life. Tony sent one Spirit into the red zone the next turn, then cast a Snapcaster Mage. A Dismember on the Mage from Christian left no available blockers to stop the Frost Titan. 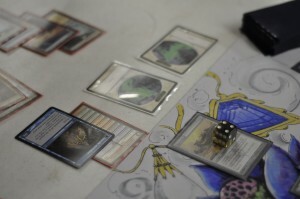 Tony began the game with a double Gitaxian Probe, revealing Christian’s hand of a Vapor Snag, Doom Blade, Think Twice, Consecrated Sphinx, and three land. His turn 2 was a Lord of the Unreal. It was Doom Bladed the next turn when he attacked with it, but Tony replaced it with a Delver of Secrets. The Delver attacked for 1 as it failed to transform during Tony’s upkeep. Tony then cast a Gitaxian Probe to look at Christian’s hand again, which had only added a Snapcaster Mage, then Tony cast a Snapcaster Mage to flashback the Probe, drawing him more cards at the cost of life. Christian began to react with a Snapcaster Mage flashing back the Doom Blade, killing the Delver and trading with the other Snapcaster Mage, clearing out the board. Tony refilled his board with another Snapcaster flashing back another Gitaxian Probe, this time revealing a new threat—Batterskull. Tony played his fourth Gitaxian Probe, looking for an answer to that Batterskull. Instead, Tony drew a Delver of Secrets, which he promptly played. Christian played a Swamp, then tapped out for Batterskull, which resolved. Tony flipped a Negate to Delver of Secrets and attacked for three. Tony dropped a Phantasmal Bear during his second main phase. The Bear ate a Vapor Snag and Christian mounted the offensive with Batterskull. Tony threw Snapcaster Mage in front of the Batterskull and continued to make tokens with the Moorland Haunt. Drawing blank, Tony eventually ran out of creatures to make with Moorland Haunt. Backed by a wall of counterspells and a growing life total, Christian’s Batterskull eventually reduced to Tony’s life total to 0—taking the game, match, and Mox Sapphire!